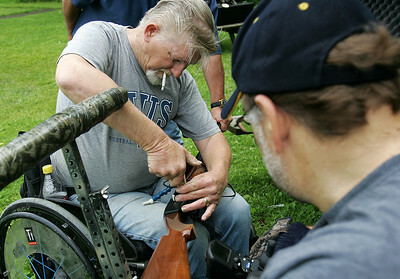 Kyle Grillot - kgrillot@shawmedia.com Navy veteran Chuck Willis of Hines (left) helps Bob Ariciola of Bartlett with his shotgun during the first annual Joe's Wish shootout for paralyzed veterans Saturday at the McHenry Sportsman's Club. Joe's Wish, a nonprofit that helps area veterans hosted the event and McHenry Sportsman's Club donated their facilities, staff, and clays. 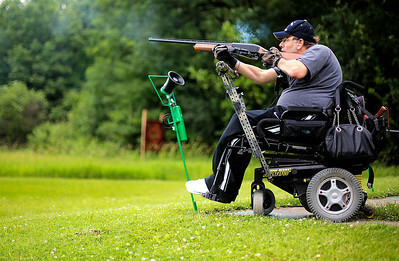 Kyle Grillot - kgrillot@shawmedia.com Army veteran John Schneck fires a shotgun during the first annual Joe's Wish shootout for paralyzed veterans Saturday at the McHenry Sportsman's Club. Joe's Wish, a nonprofit that helps area veterans hosted the event and McHenry Sportsman's Club donated their facilities, staff, and clays. 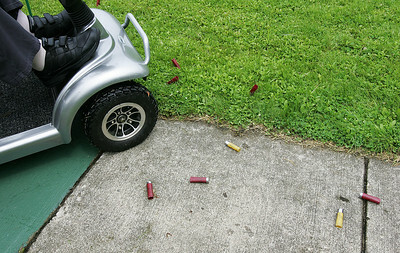 Kyle Grillot - kgrillot@shawmedia.com 89-year-old veteran, Marshall Clemons reacts after firing a shotgun during the first annual Joe's Wish shootout for paralyzed veterans Saturday at the McHenry Sportsman's Club. Joe's Wish, a nonprofit that helps area veterans hosted the event and McHenry Sportsman's Club donated their facilities, staff, and clays. 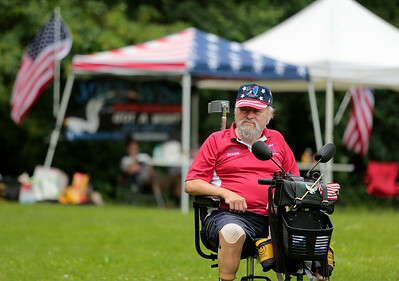 Kyle Grillot - kgrillot@shawmedia.com Army veteran John Schneck waits while other veterans shoot shotguns during the first annual Joe's Wish shootout for paralyzed veterans Saturday at the McHenry Sportsman's Club. Joe's Wish, a nonprofit that helps area veterans hosted the event and McHenry Sportsman's Club donated their facilities, staff, and clays. 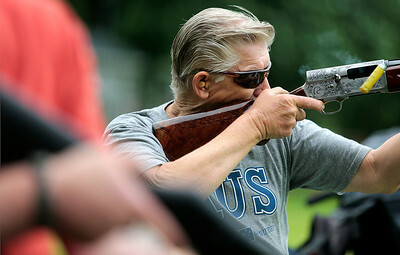 Kyle Grillot - kgrillot@shawmedia.com Navy veteran Jay Veltri of Milwaukee fires a shotgun during the first annual Joe's Wish shootout for paralyzed veterans Saturday at the McHenry Sportsman's Club. Joe's Wish, a nonprofit that helps area veterans hosted the event and McHenry Sportsman's Club donated their facilities, staff, and clays. 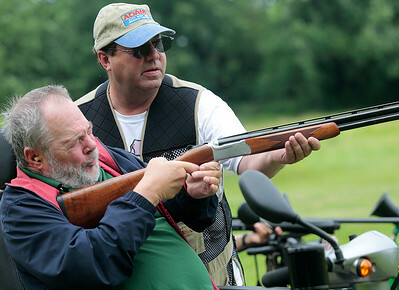 Kyle Grillot - kgrillot@shawmedia.com Veteran Keith Wetzstein of Woddstock (left) is helped by Jay Adams of McHenry while firing a shotgun during the first annual Joe's Wish shootout for paralyzed veterans Saturday at the McHenry Sportsman's Club. Joe's Wish, a nonprofit that helps area veterans hosted the event and McHenry Sportsman's Club donated their facilities, staff, and clays. 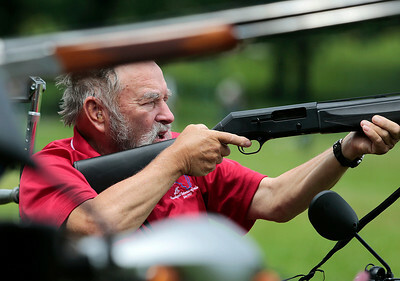 Kyle Grillot - kgrillot@shawmedia.com Navy veteran Chuck Willis fires a shotgun during the first annual Joe's Wish shootout for paralyzed veterans Saturday at the McHenry Sportsman's Club. Joe's Wish, a nonprofit that helps area veterans hosted the event and McHenry Sportsman's Club donated their facilities, staff, and clays. 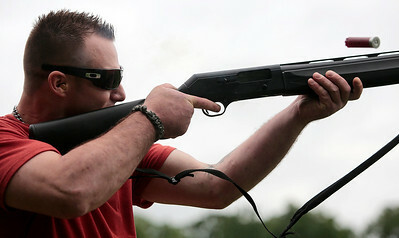 Kyle Grillot - kgrillot@shawmedia.com Bob Ariciola of Bartlett fires a shotgun during the first annual Joe's Wish shootout for paralyzed veterans Saturday at the McHenry Sportsman's Club. Joe's Wish, a nonprofit that helps area veterans hosted the event and McHenry Sportsman's Club donated their facilities, staff, and clays. Kyle Grillot - kgrillot@shawmedia.com Veteran Keith Wetzstein of Woddstock waits to fire his shotgun during the first annual Joe's Wish shootout for paralyzed veterans Saturday at the McHenry Sportsman's Club. Joe's Wish, a nonprofit that helps area veterans hosted the event and McHenry Sportsman's Club donated their facilities, staff, and clays. 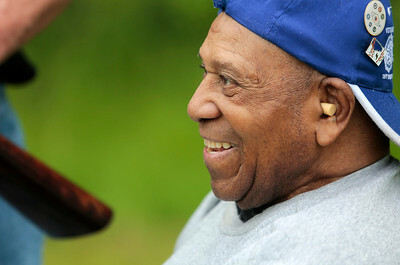 89-year-old veteran, Marshall Clemons reacts after firing a shotgun during the first annual Joe's Wish shootout for paralyzed veterans Saturday at the McHenry Sportsman's Club. Joe's Wish, a nonprofit that helps area veterans hosted the event and McHenry Sportsman's Club donated their facilities, staff, and clays.